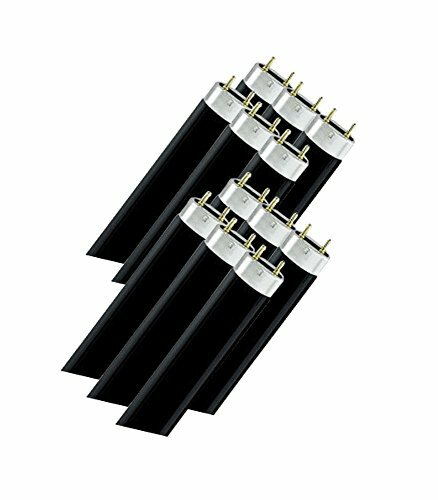 This 10 pack of 48-Inch 40 watt / 120V Blacklite Fluorescent Tubes replaces the bulb found in the Blacklight 360 (BL4360) or the American DJ 48" Black Light fixture (BLACK48BLB) as well as other fixtures using F40T8 fluorescent bulbs. 48" 40W T8 size bulb (Fixture not included). Use everywhere you want to create a visually dramatic atmosphere. Designed with a special filter glass that absorbs most of the visible light, while creating a fluorescent or glowing effect when directed at certain objects or materials. Made in China Please note that tubes/bulbs for fluorescent fixtures are not interchangeable like normal incandescent light bulbs. It is very important that you get the code of a current tube or off the fixture itself and order the correct blacklight bulb. The ballast in the fixture is rated to fire a certain wattage and diameter bulb. If you have any questions about this product by UltraViolet Distributing, contact us by completing and submitting the form below. If you are looking for a specif part number, please include it with your message.